We have a date! May 2, 2019! Deadline for applications this year is April 25th! Looking forward to interesting proposals! $10,000 Naomi Family Resource Centre (announced that night as $9.800 but late cheques topped them up to their ask of $10,000. Any subsequent cheques were donated to the third place contender, Girls Inc.
WE ARE CURRENTLY ACCEPTING APPLICATIONS FOR THE 2019 VOTE! Consider this an invitation for 2019 to join us in nurturing a worthy local cause and helping it to grow! We are always happy to welcome new members! At this point, we already have over 100 wonderful women registered for next year's event! If you would like to join or renew your membership, please let us know through the contact form! 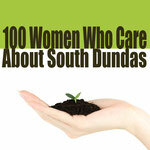 100 Women Who Care About South Dundas (really 100 plus!) is a group of women in South Dundas who care deeply about our community and are passionate about contributing to its health and vitality. Each year, we meet for one hour and make a $100 donation to a local project or cause voted on by the members. 1 hour + $100 x 100 women = $10,000 per year invested in making South Dundas an even better place in which to live! Now there’s a winning formula! Just think of the difference it could make to our many deserving local causes. It couldn’t be more simple, more fun, or have a more powerful effect, and you can be a part of it. Each member commits to donating $100 to the charity or organization that wins the most vote. There may be second and third prize winners if we have a surplus of generosity. The Playhouse has generously offered to host the evening once again this year. Each member will be given a ballot with the names of all nominees. Members who are unable to attend the meeting are invited to give their cheque to another member to deliver, and vote on her behalf. Every member will write a cheque with no recipient. We will enter that information once the winner or winners have been announced. Members agree that their cheque will be directed to one of the winners, even if the recipient is not the member's choice. That's how the game is played! Between 6:00 and 7:00 members will sign in, be offered a glass of wine and an opportunity to mingle. Each contending charity will have five minutes to present their case to the voters. There will be one vote. When votes are being counted, last year's recipients will have several minutes to report on the success of their project. Members will receive a tax receipt directly from the organization. Organizations under consideration must serve South Dundas and provide individual tax receipts directly to contributing members. The selected organization must agree not to use member information for further solicitation purposes, or give it out to any third parties except for tax purposes. Each annual meeting will open with a short update on how the funds donated at the previous meeting were used by the successful organization. Let's dream big for next year! If you have an idea for a project that you believe will enhance our community, it may be time to get organized. It's amazing what you can accomplish with an idea, a few like-minded people and a bit of elbow grease!